The way I've been practicing meditation is by sitting in a deskchair and leaning back into it so that my back and neck are supported. I have recently tried to sit upright without that support. It's not comfortable and I feel like I'm overdoing the good posture, so when I'm done meditating I stay in that posture for quite a while afterwards and it's exhausting. I have a lot of doubts about whether my posture is correct or that I'm overdoing it. How do you know your posture is the correct one? I can't tell the difference between overdoing it, doing it correctly or doing it too little. Is there any way to learn this? I would like to develop the ability to meditate without supporting my back but I don't know how to do it. I hope someone can help me. I see! This is very helpful, thank you for this. I think one of the main problems that I personally have is that I don't know how to position my head / neck. I feel like I am pushing my chin too much towards my neck but I'm not sure. So what I am trying to say is that I'm having trouble determining whether my head / neck is positioned correctly. I will continue the way I used to meditate until I'm able to sit upright without support, and I will combine that with training my body to sit unsupported. If someone has advice on the head / neck part it's very much appreciated! I personally do not believe in positioning the neck or head in any particular specific way but to let the head & head find their natural place. As the breathing & body calm with practise, sometimes the neck & head will naturally move, such as the head/chin might lift & the neck extend to allow for some longer breaths & the freeing of some stress. Then the head & neck will settle again. Personally, I do not believe in a Zen-style practise of maintaining a rigid & specific sitting posture. I will try to not pay too much attention to it. I think I'm overdoing the good posture thing. Thanks for the reply! I've come back here after some time as I have just changed tradition (from 5 years of Goenka to Thai Forrest) and thus trying to change my posture. I was potentially going to ask a question about posture, but this video made it clear, or clearer. I usually sit on a flat stool with my legs crossed below and under. This helps me keep my back straight and is a comfortable posture for me. I have been trying a half lotus posture lately however, after suggestions from some thai forrest monks, they say it is the most beneficial posture for meditation and with time one would get used to it. But I feel I have been forcing myself in to it a bit too much and worry about the long term effects, when I sit in this posture there's a lot of pain and rigidity. Perhaps it is better to find a teacher to guide us through it, as the person in the video above suggests. 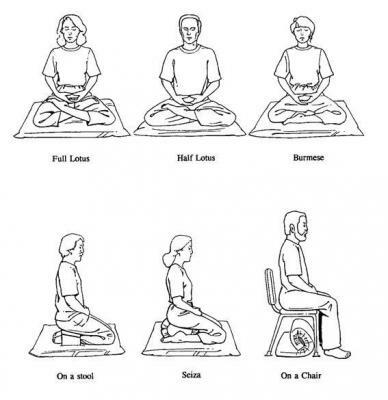 I think there could be some ego involved with trying a half lotus or lotus posture also. It's probably the most visually appealing posture looking at it from the outside. The monks I talked to said this is an important part of it, when a group of people sit together in the same posture, it looks beautiful and balanced, but perhaps it is better to be comfortable rather than trying to fit in and sit like the statue of the buddha.